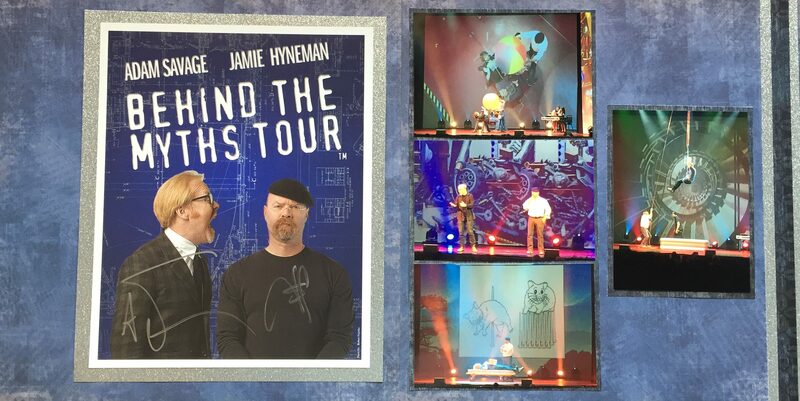 My son and I love watching Mythbusters, and when we heard that they were coming to our area I knew I had to buy tickets right away. We started the evening eating at Mesh on Mass, a high end restaurant with very innovative food. The meal was amazing and the desserts were scrumptious. You can see our decant delicacies on the left hand page. I also attached the business card to the page to remind me down the road of the restaurant. The right hand page starts the adventure to see the Mythbusters with pictures outside of the venue, and the “curtain” that was on the stage before the show. If you look carefully at the background pages of these two spreads you will notice that it is the same pattern, but in different colors. This was how I was able to bring these two seemingly disparate events and color schemes together on one spread. 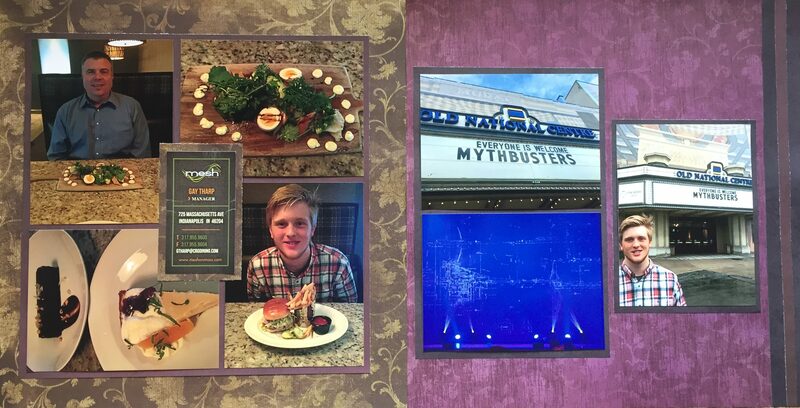 I chose brown for the restaurant to match the table top, and purple for the Mythbusters to complement the color scheme of the show, and the color of my son’s shirt. This second spread shares our signed photograph of Adam and Jamie and some pictures I took during the show. The guys did an amazing job of being entertaining, fun, and educational all at the same time – but what else would you expect from these two!? For the background of this paper I chose an industrial themed blue background which complements the background of the autographed pictures, as well as the backdrop to the stage show. I don’t know if the guys are going to continue to have tours – but if they do – it is an amazing experience for kids of all ages (and their parents too!). And for your young ones that like building their own experiments and projects I would love to share Kiwi Crate! They send you a new project every month for your child to work on.